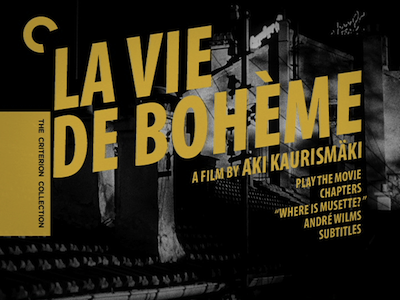 There is a mutual appreciation society between New York indie icon Jim Jarmusch and quirky Finnish filmmaker Aki Kaurismäki, and that spiritual and creative connection has never been more evident in any of the Kaurismäki films I have seen than it is in his 1992 effort La vie de bohème (The Bohemian Life). Like the early works of his Aki's New York compatriot, it's a lazy comedy drawn in warm tones, inhabited by genial losers, and depicting a pocket of society just around the corner from the norm. Based on work by writer Henri Murger that also served as the inspiration for La Bohème (and thus all the iterations that followed), La vie de bohème also owes a little something to the tradition of similarly minded efforts featuring ex-pat artists and writers and the bungled romances that plague them, such as Ernst Lubitsch's A Design for Living [review] or even Stanley Donen and Gene Kelly's An American in Paris [review]. 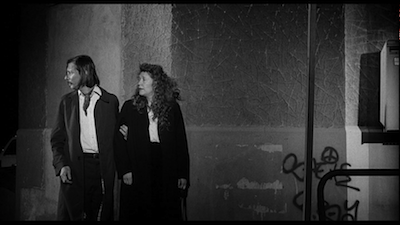 La vie de bohème is quintessentially Kaurismäki, however, and unmistakably European. 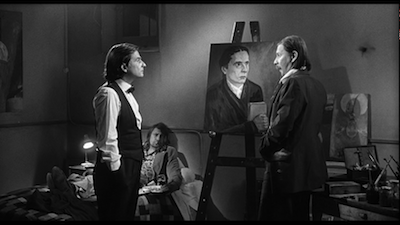 The trio at the heart of the film are Marcel (André Wilms), a struggling playwright; Schaunard (Kari Väänänen), a loutish musician; and Rodolfo (Matti Pellonpää), a refugee from the Soviet bloc making his way in Paris as a painter. Marcel is being evicted from his apartment, and Schaunard is moving into it, and after a night of drinking where the writer shares a glass or two (or five) with Rodolfo, the three become fast friends. 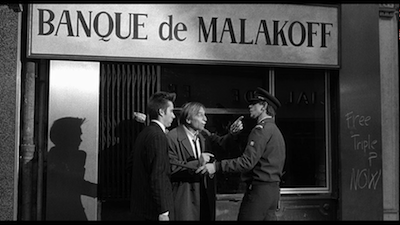 Kaurismäki's script details their various schemes to stay afloat, including Marcel's taking over a burgeoning fashion magazine (his publisher is played by Samuel Fuller, a mentor to Jarmsuch, as well) and Rodolfo bilking a naïve art collector (Jean-Pierre Léaud, who is a dynamo in both of his scenes). In the midst of this, Rodolfo has a romance with another immigrant, Mimi (Evelyne Didi), gets deported, and then comes back. He is, arguably, the driving force of the narrative. If nothing else, he serves as some kind of conscience, the guy that, were he to do better, could change everyone's fates. In particular, he holds to some stringent ideals that adversely affect Mimi. His old-fashioned views on the relationship between men and women are as impractical as his chosen lifestyle. It's up to Mimi, as well as Marcel's girlfriend/secretary Musette (Christine Murillo), to provide the voice of reason, worrying about such pesky things as food, rent, and delivering on promises. Kaurismäki has a good time with the classic story, infusing it with his own kooky sense of humor while also having fun with the conventions of nineteenth-century dramatic novels. Naming Rodfolfo's dog after Baudelaire will give you some indication of the reverence (or lack thereof) the auteur holds for classic authors. La vie de bohème goes from silly to melodramatic parody before finally settling into a fairly dark finale. The artists of the piece have spent the movie trying to dodge all responsibility, including the results of their own actions (or inaction). Inevitably, this is an unsustainable practice, and Rodolfo is forced to face his own selfishness when his bad habits lead to him being very much alone. The cast of La vie de bohème is populated with Kaurismäki regulars, all of whom click well together and have little problem balancing the absurdity of most of the script with its all-important moments of realness. Pellonpää plays a similar straight-man role to his one as the manager in the Leningrad Cowboys movies [review], while Wilms' trademark earnestness, seen most recently in Kaurismäki's Le Havre, makes him a rather delightful con man. His scene where he escapes from a thug by distracting a cop with a quickly improvised story is something straight out of a 1930s comedy. One gets the sense that Marcel's writing is likewise a feint, or at the very least relatable only to himself. We are spared hearing any of his prose. 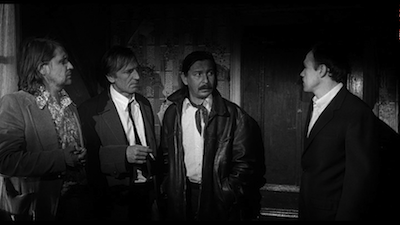 When it comes to the boys' art, Kaurismäki reserves his savage humor for Schaunard, who plays a song that is a weird hybrid of John Cage and German noise and industrial. It unsurprisingly sends both Mimi and Musette running out of the room. Fans of early 1990s indie cinema will appreciate La vie de bohème's casual pacing. The movie is in no real hurry and is as content as its characters with letting the rest of the world move on as it stays settled. 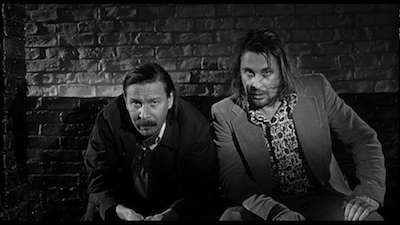 Timo Salminen, who is Kaurismäki's go-to director of photography, shoots the movie in black-and-white, and will inevitably draw comparisons to similar work by Tom DiCillo (Stranger than Paradise [review]) and Robby Müller (Down by Law). There is a clean look to everything, however, that separates it from its grainier cousins. For all the squalor the layabout artists indulge in, there is a shabby beauty to how their lives look on film that is reflective of the everyday experience they attempt to capture in their own work. When they bother to do it, that is.